Theaker's Quarterly Fiction 34 – terrible delays! I'm really sorry for the lengthy delay in publishing issue 34 of our lovely magazine – and I can assure you that issue 34, when it finally sees the light of day, will be as lovely as any other! The reason of course is that I got dragged kicking and screaming – or at least with a shrug of resignation – into handling the administration of FantasyCon 2010, and that has soaked up my weekends with little regard for any other projects I wanted to work on. But things are definitely going to run a little more smoothly from next month. David Howe is planning to take over as chair of the BFS, so that's one job off the list. I won't be involved in FantasyCon 2011, other than as an inebriated attendee, so that's another. Once I get back from this year's FantasyCon I'll be finishing off Theaker's 34 and then rolling straight on to issue 35. John's been reading our submissions this year and he's picked some brilliant stuff for the next few issues. Thanks for your patience! Jim Fuess, cover artist of Dark Horizons #53, has updated his website (www.jimfuessart.com) with eight works in the new collision series from the Sticks and Stones show at the Watchung Arts Center, including Collision #8, Collision #3, The Brain in Color, Wave #5, Orange and Purple Abstract and Jump. The show was organised by the New Art Group. Terry Martin, editor and publisher of the BFA-nominated magazine Murky Depths, has blogged about the pitfalls that await anyone launching a small press magazine. I'd pretty much agree with all of that, especially his first point. The amount of work involved – or skipping crucial parts of that work – does seem to put paid to a lot of new magazines. The only thing I'd add to Terry's points is that, from my experience, anyone planning to launch a small press mag needs to decide right at the beginning whether it's a business or a hobby – to make a profit or just for fun – because that has to inform everything else: the payscale, format, frequency, distribution, ad rates, publicity, etc. A story of fate, passion, jealousy, suicide, bullfighting and translation from 1950, Pandora and the Flying Dutchman takes place twenty years earlier in Esperanza, on the coast of Spain, but its story begins centuries before that. On trial for an appalling crime, Hendrick van der Zee blasphemes most dreadfully and is cursed by God to wander the seas of the earth until judgment day. There's a way out: every seven years he gets to spend half a year among men, to find a woman who could redeem him, a woman willing to give up her life for him. Pandora Reynolds understands unreasonable demands, since she makes them of others: she tells one suitor that she will not consider his advances unless he pushes his car off a cliff, but considers their deal broken when he recovers it from the ocean. She's a drama queen, a vicarious thrill seeker who, unfulfilled by her life, chooses "fury and destruction", as the Dutchman says. Meeting, they are overwhelmed by their mutual need, though knowing what must result he resists as long as he is able. For a restored print, it's a bit scratchy, and the colour is very variable – traces perhaps of why it required restoration in the first place. Despite that, the beauty of the film shines through: each shot resembles a carefully composed oil painting, often with symbolic intent – when Pandora and Hendrick kiss for the first time, and in other crucial scenes, his ship is visible in the distance, hanging over them, predicting their doom. The narration is sometimes rather on the nose, with the actors appearing to act comically in response to the narration, but the performances are otherwise excellent, James Mason and Ava Gardner in particular being quite wonderful as the Dutchman and Pandora. Though Pandora's depiction in the film is unflattering, a feminist reading is possible, by which she is frustrated by the limitations of her times, and forced to live through the men in her life. "Happiness lies in the simple things," says Stephen Cameron, her rather aged suitor, but given his determination to break the land speed record it's clear the maxim is for wives rather than husbands. Given the opportunity, Pandora might have found fulfilment and drama behind the wheel of her own racing car, rather than in the arms of a tragic ghost of times past. It's a remarkable film, and one whose re-release is well-timed to appeal to fans of modern films of supernatural romance – though given its tragic conclusion, and the way that conclusion is presented as heroic, beautiful and inevitable, it's perhaps the last thing maudlin, love-struck teenagers should be watching! 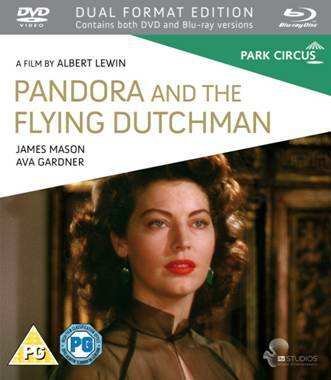 Pandora and the Flying Dutchman, Albert Lewin (dir/wri), Park Circus, DVD/BluRay, 1hr58.